The second quarter of 2018 has seen the lowest number of completed venture capital deals in nearly seven years, according to our 2Q 2018 European Venture Report. This reflects the continued global trend of falling transaction counts while capital invested continues to rise, as evidenced by 2Q 2018 recording four times more total deal value than in 3Q 2011, representing €4.8 billion. Here are eight key charts with highlights from the report, which is available to download here. 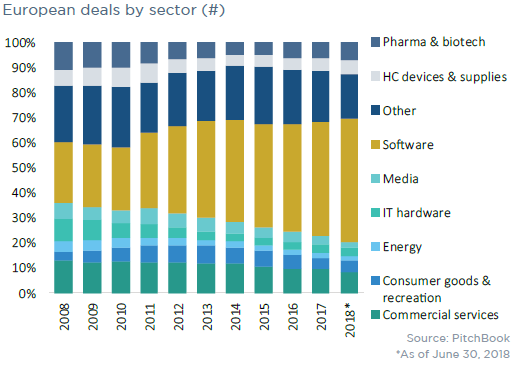 Although the number of deals has dropped across all stages, late-stage VC has proven to be the most resilient, with bigger deals representing a larger proportion of total deals this year than in the previous five. This has pushed the median size of VC transactions upward. Mirroring last year, software remains the most popular industry with VC investors, and its popularity is continuing to grow. The second quarter of 2018 has seen three new unicorns created–Revolut, Taxify and Celonis—all of which are software companies, while operating in different industry verticals. The increased amount of capital available has led to a rise in CVC investing in European startups. 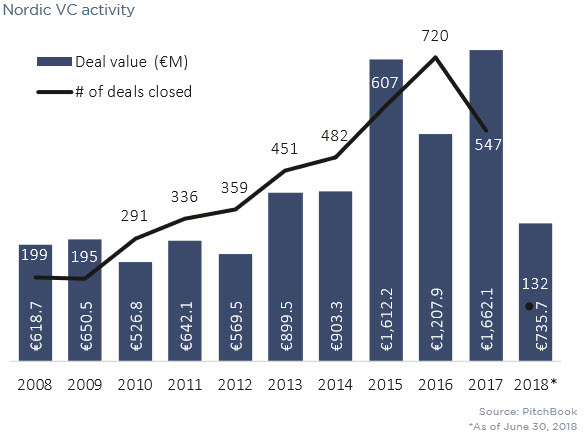 Corporate venture arms have so far this year spent €4 billion across 323 deals, with late-stage transactions taking up a larger portion than in previous quarters. The Nordic region has established itself as a thriving venture ecosystem in Europe, having seen several multibillion-euro exits this year, including those of Spotify and iZettle. VC activity has slowed in the first half of 2018 compared with last year, but the region is still set for a healthy year in terms of venture spending. The exit market is on track to best €10 billion in value for the sixth straight year, suggesting that valuations have not overextended—yet. 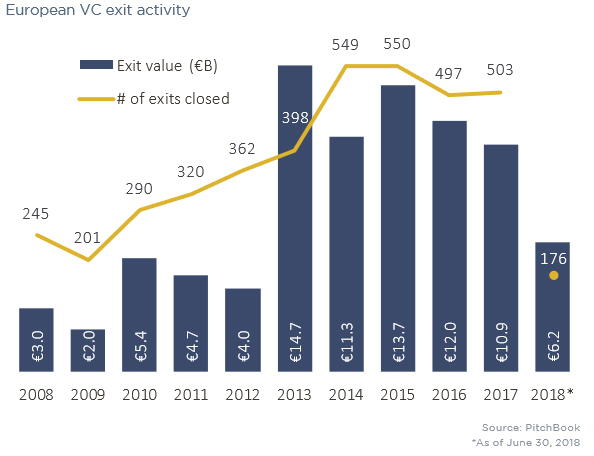 This year is also set to raise the highest amount from exits since 2015, despite falls in the last two years. IPOs have continued to perform strongly with a total of 19 public debuts in 2Q, the most in a quarter since 4Q 2015, for a total of €1.6 billion. Acquisitions, however, remain the most popular type of exit, while buyouts of VC-backed companies have seen a marked reduction in frequency. Capital raised for funds is likely to exceed 2017, with limited partners having already allocated €4.6 billion in the first half of 2018. This is despite a slide in fund count, especially among smaller vehicles. With the increase in deal size, funds such as Highland Europe’s €463 million tech vehicle are becoming more common than their lower counterparts. 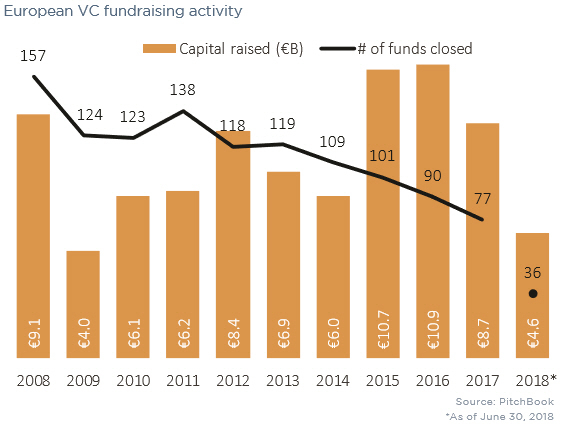 The UK & Ireland still lead in terms of capital raised and fund count, although fundraising in Germany and Israel seem to be gaining momentum. Indeed, Israel's 9 vehicles closed in 1H 2018 gains it a 10% market share in terms of European VC vehicles for the first time on PitchBook record. For a more in-depth analysis of Europe's venture landscape, check out the 2Q 2018 European Venture Report.